Susie Harris: Petit Coterie Giveaway! I think they already feel at home here..dont you. It was such a pleasure working with Michelle, the woman behind these beautiful creations. each adorned with one of these medals. I chose the slip cover pillows because I had two exsisting red pillows from my red sofa. you can visit her here Petit Coterie. Comments are now closed. Thanks for playing ya'll! I follow your blog faithfully but don't leave a comment very often. But I love your style and I would sure love to have one of these pillows on my sofa. Please enter me in your drawing. Happy Monday! Love the pillows! Would love to win! I do love Petite Coterie. I think I may have even ordered a pillow or two from her before. I love reading your blog Susie. I love your style and your sense of humor! These pillows are adorable!!! I would love to win! The little medal is the icing on the cake, too cute! They're beautiful. Hope I win. Love the pillows - would love to win - count me in!! Well, my goodness yes, Susie. I would love to have one of these gorgeous pillows. Please add my name to the hat. OOOOH count me in! Lovely! Great giveaway, Susie and Michelle. :) I'd love to win! I'd love to win the Hotel de Pavillon one! Thanks to both of you for the giveaway. How Sweet! I'd love to snuggle with one one my couch! The pillows are beautiful! I'd love one! Ohhhhh those are quite beautiful. Sweet giveaway. Those are gorgeous - but I think my puppies would eat em up. If I win though, I will send it on to my sis-in-law because it would go perfect with her decor AND her puppy isn't destructodog. Ohhh Susie they are beautiful on your newly covered sofa. The medalion is such a sweet touch. Her attention to detail reminds me of yours. These are absolutely fabulous. Count me in, thanks for the chance! So lovely. I love the burlap with the french captions. Ooh La La! Love that burlap! Thanks for the chance to win! Wow, the pillows are beautiful! I want one! Those look so perfect on your couch, Susie! :) You have great taste! Those pillows look so lovely, please count me in Susie. I am going over to check out her site. those are beautiful pillows and I love the added dash or the medal on the corner! So adorable! Please count me in. ooola la...count me in as well. Susie, somehow I landed on her website yesterday and was in awe of how beautiful those pillows are! I am crossing my fingers hoping to win one! I love that these are just pillow covers! My place is tiny and while I have a pillow obsession, there isn't enough room to store tons of the things. Pillow covers are perfect for us small space dwellers! Those pillows are fantastic! Thanks for a chance to win one myself! Love these pillows!!! What a sweet idea to add the charming medallion!!! Oh, good golly those are beautiful! I've been to her site several times just to stare and drool. I'd LOVE to have one of those in my house. The pillows are beautiful! Please count me in. Love the pillows, Susie. Seriously. Love. them. These are beautiful - thanks for sharing! Love them! You have the best giveaways! Gorgeous!! And they look PERFECT on your white sofa!! Gorgeous pillows! I love what you're doing with this room makeover. Beautiful pillows! I am completely in love with burlap right now. They are gorgeous! Love the religious medallion addition. Love these! Especially the medals. They look great in the room. I am goingt the way of cream slipcovers for my living room and looove how they look. Oh, la, la!! I am loving these!! I love these pillows!! Thank you for such a fun giveaway! This type of pillow is so popular now. But of all the ones I've seen, these are by far the prettiest!! I just love them! Those are beautiful! Thanks for the opportunity to win! Love, Love, Love these! Thanks for the opportunity! Those pillows are great! they would be perfect for my new guest bed!! Gorgeous pillows. Faithful follower of your blog; puppy update please!!!! Cute pillows! Love the French style! Love these and would love to win one! Thanks! Wow awesome pillows - I follow your blog and would love one! LOVE these pillows - and great giveaway. Oui, oui! I have my fingers crossed for such an adorable pillow. LOVE these pillows! I hope I win! Love these...would be great in my family room reno. I am working on...hope you are well! I love these pillows. I can't believe burlap is just now showing up in Oklahoma! LOVE those pillows! I need one in my home! Oh la la - très jolie!! 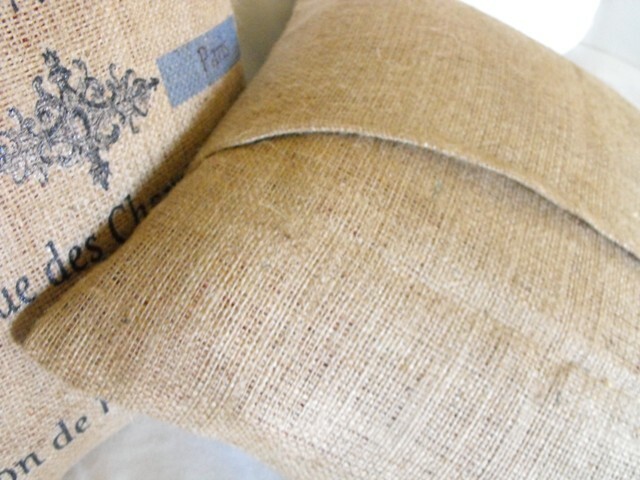 I have a burlap pillow and would love to add to my collection. I'm totally digging your "new" white sofa. Dang you, girl. ;) I'm on the lookout now. Have a blessed week! Love her creations! 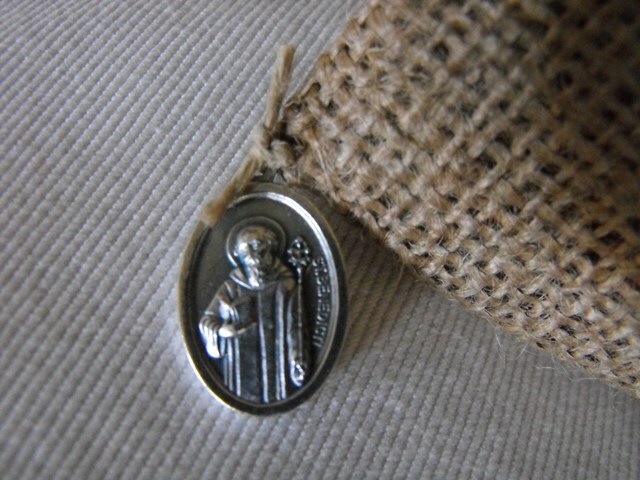 I especially appreciate her special touch, a Benedictine Medal. 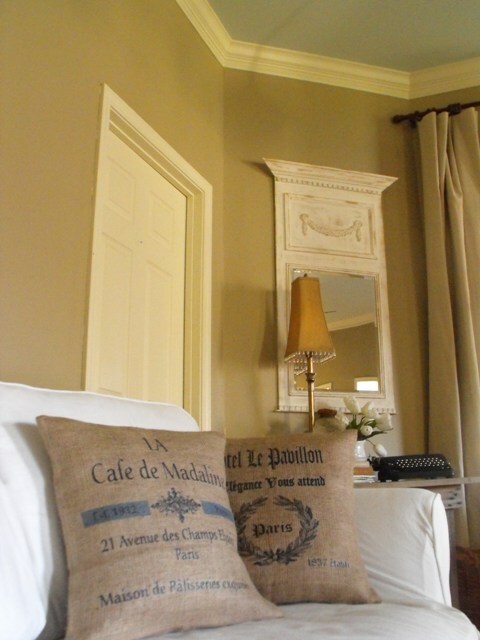 whoaaa i love the Fleur de Lis with Crown Petite Burlap Pillow!! Wonderful pillows~ look great on your slipcover sofa. So fresh! I would LOVE to win a pillow! Susie those look so perfect in your room! I love the crown one! Oh, I love them! They look great in your living room! Oh, those are lovely! Thanks for the great giveaway Susie and Michelle. beautiful pillows and they look right at home on your newly slipcovered sofa. LOVE LOVE LOVE These pillows! Thank you for the wonderful giveaway. Susie I checked out Michelle's site after spotting her button on your blog last week - love her work! The pillows look SWEET on your new slipcover!! I adore these pillows..and your blog is so fun to follow and has the best ideas! Thank you for the chance to win!! PS I don't have a blog..but I'm thinking of conjuring one up! You taught me how to make an amazing sign for my boss and she teared up when I presented it. It was so amazing and I feel so blessed that you showed me my artistic gift. I will never forget that. Thank you x's a million! Gorgeous pillows! They look lovely on your white upholstery. Gorgeous pillows! They look wonderful on your newly slipcovered sofa, too! Thanks for the introduction to a beautiful place....le petit coterie! As always Susie, you have such wonderful, simplistic, classic style. LOVE IT! Please enter me in your give away. Susie - thanks for the opportunity to win a gorgeous pillow! Would you please tell me more about the tiny medals? So unusual. What a great touch! Oh my gosh, those are so beautiful! Would love a chance to win one! I just love this pillow and would be so happy to win it! Your blog is adorable and puts a smile on my face! That pillow would fit perfectly in my bedroom. What a wonderful giveaway. I'm off to visit her "store," too. Thank you!! These are too die for!! I love them! I also love reading you blog :0)! Wow! I would sure love to win one of those pillows! Susie! Can you hear me screaming in delight on my end of the screen?? 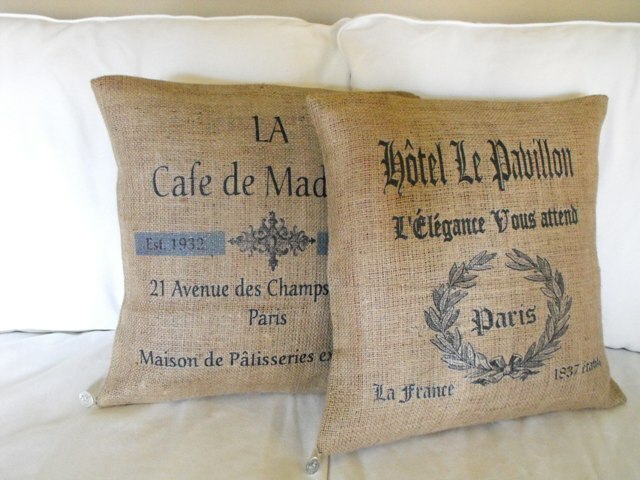 Burlap, Paris, and pillow all in one?? Yay!!! I LOVE this giveaway!! These things are the most darlingest (A word I am going to use even if it's not a word) pillows Ev-uh! Thanks for giving us the chance! LOVE THESE! I absolutely love my pillows from Michelle. They are the finishing touch on my bed! How sweet of you both to be doing this giveaway! Thanks so much! I can definitely see these in my living room! Love these pillows! So glad I "stumbled" upon your blog. love it! Well I have been very lucky to win 2 yes TWO giveaways this week!!! So I had best not be greedy and ask to enter yours, instead I just want to say keep up the wonderful work, and say hi to your Sister! Ha ha, she popped over to my place (over the pond!) and said hello, very nice of her to do so, but give her a nudge and tell her to let me in on more your sisterly antics! Love both your blogs, but I shall go now, as I have a terrible habit of going on too much, gosh, have I written ALL that???? hee hee. Gorgeous!! I'd love to win! Love those pillows! I want one! 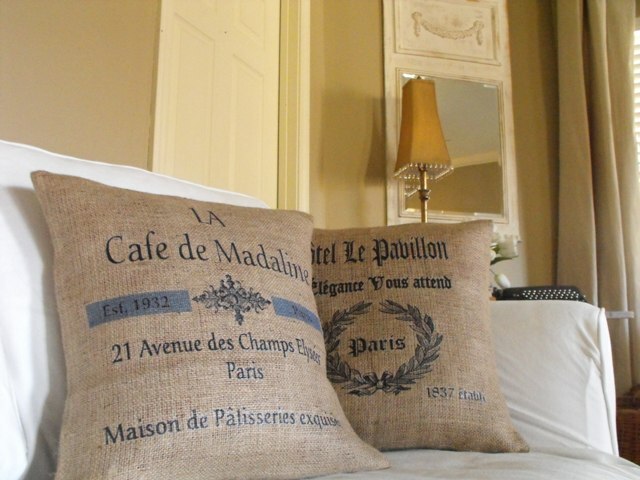 I love burlap,, those pillows are sooo cute. Very interesting pillows indeed. They look lovely on your couch..but I think I have a spot for one. HA! So beautiful!! What a generous givaway. I am so in! Love the pillows they are frenchy chic! Oh, my, my, my! I'd love to win that pillow! Oh, I have the perfect spot for such a lovely pillow! Thanks for introducing me to this very talented lady and for offering this tremendous giveaway!! How beautiful they are. And yes, they look right at home on your "new" sofa. Adore these! Love, love, love them all! They look terrific on your new slipcover! Luck of the Irish be with me! Anyone know a leprechaun??? Just what we're looking for. Reminds me of my trip there, would love to add that memory to our home! Gorgeous!! Pick me, pick me! The pillows are gorgeous and I would love a chance to win one. I have just the perfect place for it to spend it's days. It will be loved and never neglected. I sure do want one. Love them so much. Where did you get those curtains? Love the way you doing this room. 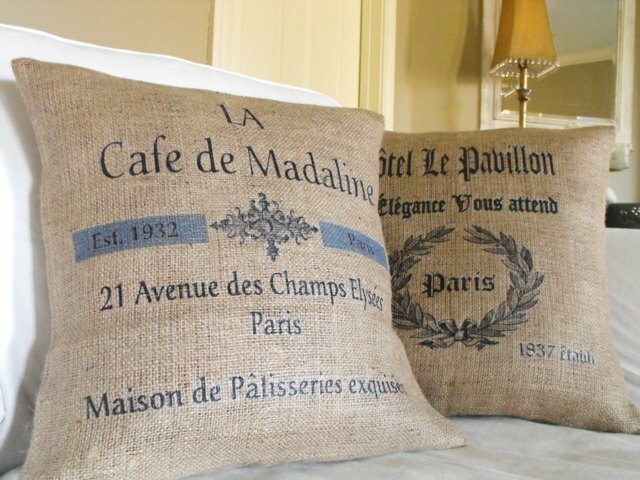 These are GORGEOUS and certainly kick burlap up a notch. My fingers are crossed that I win as I have just the place for it. Oh I am in love !!!!!!!!!!!!!!!! I love the personalized family pillow. It would be perfect in my home. OH...if I won..I will be taking my pillow to my lovely seat at pharmacy school --- that place needs a little SCRUMPTIOUS piece to fab it up a bit. :) Imagine the looks on my classmates...but hey...I think it would be divine in my little black chair. :) And obviously then come home to my Master Bedroom. Wow great give away. I have been following your blog for a little while now and really have enjoyed your design eye. I loved the post on the mirror that you decided to build. It's beautiful. Have a great night and I look forward to the next bit of inspiration! Love those pillows and they look great in the photo with your mirror on the wall behind them! Thanks for the great giveaway chance! What beautiful pillows. I would love to give one these pillows a new home! I love pillow covers. I am on the lookout for two right now. These are lovely. Love the pillow covers! I'm keeping my fingers crossed. I love the pillows! I'm crossing my fingers for one! Thanks! How beautiful are those pillows? Oh wow! I love the little medalions too. How fun is that? Hope you're having a fabulous Monday, Susie!! By the way, I like your little screen makeover. I, too want to redo lots of things I've already redone. :) My projects will never end, so I like checking on yours, too! These are beautiful! Thanks for the chance at winning one!! oooohhh la la!! I love her pillows. I especially like the two that you picked out for your living. They look great. love your blog! love these pillows! I would love to win one of these. They look great on your white sofa! I just love the pillows and can't wait to see your "new" white sofa. Thanks for sharing more of your creativity. These pillows couldn't be any more perfect for the style of your home. I would love to win one. oh yes yes yes !!! absolutely love the pillows. Love the pillows! Great giveaway! What gorgeous lovelies! I would la la LOVE to win! I how I love these! I never win but I'll def keep my fingers crossed this time! I LOVE these! The summer before my daughter got pregnant for the first time, we went to France. My granddaughter is nearly 11 now, but the memories we have are priceless. These just "sparked" those memories once again! I have had the "cafe" pillow in my favorites for a while now, I love that pillow! Those pillows are so lovely, especially with the addition of the small token. Love that. awesome! I follow yourblog daily.....love the look of these...would be great on my sofa! very pretty...these would be perfect in our new home! I love these! i just painted our living room a blue gray color, and a pillow would just top it all off. What amazing pillows, I would love to be entered in your drawing. Thank you so much for sharing your wonderful pictures with us. I would love to win these! They are beautiful. Count me in the drawing. I am a follower also. Love the pillow, love your signs, and love the posts you do. I loved your pillows so much that I ordered one. Would love to win one too! You can never have too many. Fabulous French pillows and the little charms are too sweet!! And what a generous girl to give one away!! I would absolutely LOVE to win one of these! Thanks so much for the great giveaway!! An apartment dweller that dreams and lives through your home and creations. Thanks for the inspiration to make my little home something special as well. Omg I love these pillows and I love your blog. Please add me to your drawing. Thanks for hosting. Oh fun! Very cute pillows.. I'm absolutely over the moon for those pillows! i love those and they look perfect on your new white slipcover! Oh, those are just beautiful!! Oh Susie, these are lovely!!! Please enter my name. I hope I am not too late! have a blessed day! I have always loved these pillows and have attempted to make my own. Unfortunately, mine never came out anywhere near as perfect as these. Please enter me in the giveaway. Love the pillows. Please enter me. She does such nice work too!! I would LOVE to win! I am just re~ doing my bedroom and they would look so pretty!! The pillows are perfect on your newly slipcovered couch. Thanks for the chance. I too, quietly follow your blog...I love the changes you made recently to your "no more red, hello white" room. Please enter me in your drawing. Thanks! These pillows are très chic. Please count me in for a chance to win. ThanX! Bonne chance mes amis - espoir d'I de gagner aussi ! I'm on my way to her website right now... so cute! I cannot believe that I almost missed out on your giveaway! I must have been out of town and behind on postings. Whew, glad I got in.